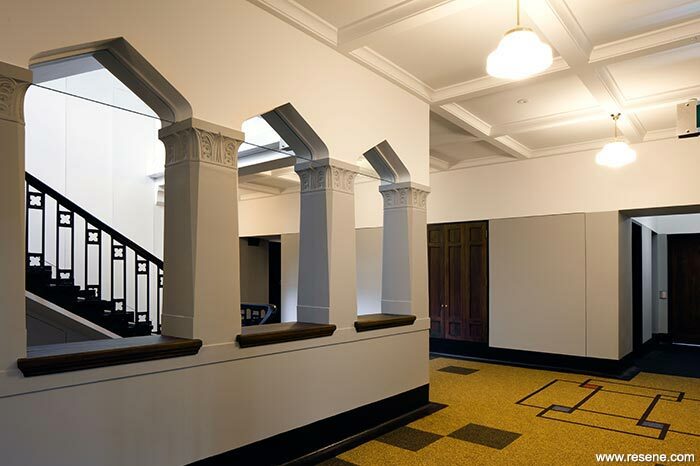 Designed by the renowned American architect Roy Alston Lippincott, the Sir Geoffrey Peren building was completed in 1931 and is recognised as a Category 1 historic place by the Historic Places Trust. Originally known as ‘Old Main Building’, it was renamed in 2010 to honour Sir Geoffrey Peren, the founding principal of Massey Agricultural College. This 5,700m2 upgrade of the Peren Building’s interior encompassed teaching spaces and offices as well as more specialised facilities such as a drama suite, a media laboratory and a function centre. Teaching facilities have been extended with new flexible lecture and tutorial rooms, computer labs and specialised teaching spaces for particular departments. Interior circulation and wayfinding have also been improved, while new fire design and the installation of sprinklers allow for the removal of fire separations, restoring the building’s original light-filled interior. A key space in the building is the central auditorium, which has been restored to its original elegant form. This refurbishment respects the integrity of the original ‘Spanish Mission’ architectural style, preserves one of New Zealand’s iconic heritage-listed buildings, and ensures that Massey University continues to provide a world-class teaching environment. The overall architectural approach to the project was to restore and respect the areas of the building with key heritage values and material. These include the entries, main corridors, the stairs, the auditorium, and the heritage toilets. The rooms leading off these, which had already seen much change, were the places selected for more modern interventions. The heart of the Sir Geoffrey Peren Building is the auditorium. This impressive, double height hall, with balcony, retained much of its original detailing, and the decision was made to reinterpret the original colour scheme with Resene Putty (strong cream) on the lower walls, which is a close match to the original. Resene Half Rice Cake (starchy white), the standard neutral on the project, was chosen as a white to complement the Resene Putty and the natural wood finishes throughout the building. The dark ceiling colour, Resene Double Felix (grape red brown), is not original, but was chosen to add drama and warmth to the space along with the traditional dark red seating and curtains. 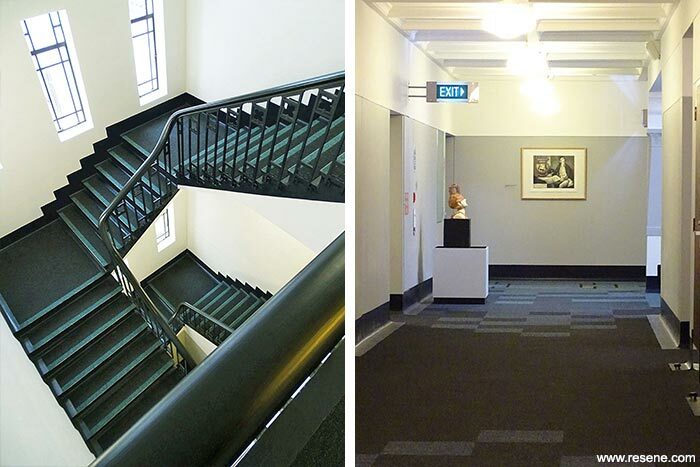 Moving out from the auditorium, the next heritage spaces are the main corridors, and the four identical stairwells, one at each internal corner of the hollow square layout of the building. This layout, while providing easy access between the floors, had no differentiating features, and as the windows look inwards across the light wells and auditorium, the result was a building in which it was very hard to orientate yourself. To resolve this, the design team looked to the colour wheel, and selected four tones equidistance apart. The two warm tones (red and gold) were used for the two northern stairs, and the two cool tones (blue and green) were used for the two southern stairs. 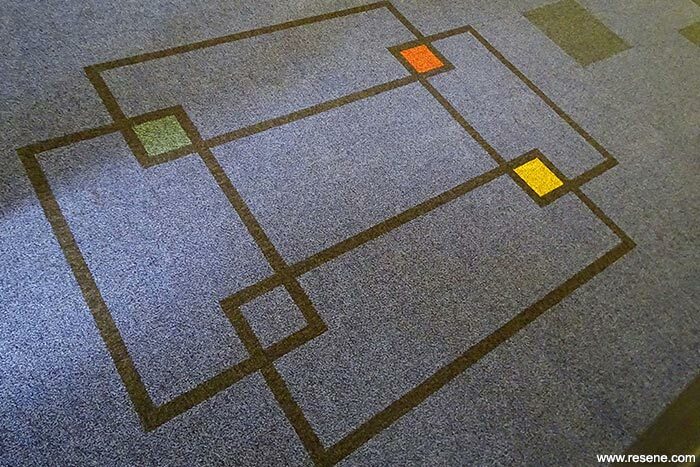 In the corridors the colours are seen mainly in the carpet, where a bright version of the colour is in the stair, and in the corridor corner. 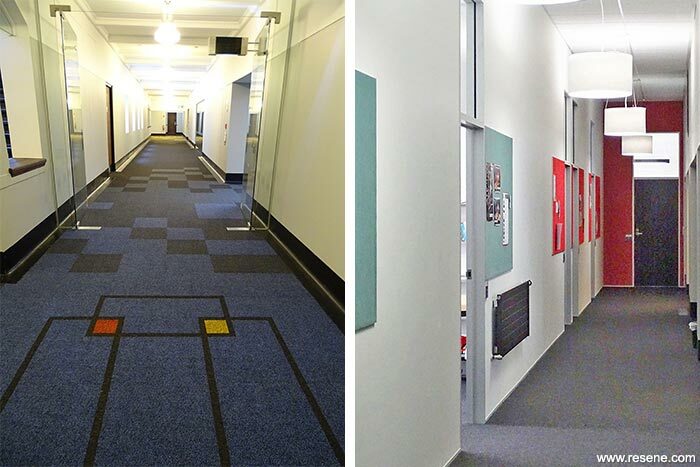 Carpet tiles in more muted versions trail off into base grey carpet along the corridors. This means that each corner and stair is identified, and identifiable. It also means that a person standing at a corner can see both their own colour, and the colours at the other ends of the two corridors. Resene paints were used to further reinforce this colour identification, with rooms in each corner having an internal wall painted in the hue of the corner – Resene Well Read (hazy fruity red) in the north east, Resene Noosa (warm gold) in the north west, Resene Norwegian Blue (slate blue) in the south east and Resene Breaker Bay (blue green) in the south west. This was designed to aid in memory to help find the lecture room, meeting room or office that you were in last week. This colour strategy has worked well. Occupants now identify their offices by shorthand reference, i.e. ‘L3 red’. The main corridors themselves had the same original low and high wall colour differentiation as the auditorium. The decision was to use a neutral, Resene Foggy Grey (watery grey), for the lower portion of the wall, and it has been very successful at working with each of the four corner colours, while providing a definite difference to the Resene Half Rice Cake on the upper portion of the walls. Resene Foggy Grey has been very popular with Massey staff providing an exceptional background for the large art collection now installed in the corridors. Sub-corridors were created off the main circulation routes to serve a group of staff offices. These corridors were treated as new, and the colours are simple; white walls, black doors and skirtings in Resene Chimney Sweep (inky black). The end walls of each corridor are painted in the corner’s colour, and the noticeboards at each door also continue the theme. Stair tread surrounds and rails are also in Resene Chimney Sweep. Entry woodwork is finished in Resene Aquaclear to provide protection while allowing the natural beauty of the timber to be seen. Most of the paint used was Resene SpaceCote Low Sheen, which has been particularly good in distracting attention from the irregularities of the original finishes. 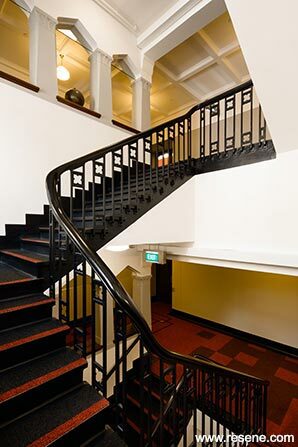 In contrast to this, the Resene Lustacryl semi-gloss waterborne enamel used on the high curved plaster skirtings, door frames and stairs harked back to the time of enamels and gloss finishes that would have been used originally. The exterior of the building was repainted in the original colours using Resene X-200 weathertight membrane with steel windows in Resene Armourcote 221 and Resene Uracryl 802 tinted to Resene Double Felix. The painting contractor had to factor in the extreme cold of a Manawatu winter in an uninsulated, unoccupied masonry building. This led to extreme condensation and difficult painting conditions. The Sir Geoffrey Peren Building by Studio Pacific Architecture won the Resene Total Colour Heritage Colour Maestro Award 2016. The judges thought: “This building was originally designed by the renowned American architect Roy Alston Lippincott whose work is punctuated throughout New Zealand. The influences and colour application is respectful of the restrained work of Lippincott. Careful research into this building’s past was used to guide the current colour choices. Line and form are clearly defined acknowledging the building’s history and heritage.